Scott has written about the Lost Thunderbird Photo before, way back in 2010. It’s something I’ve been thinking about recently for some reason, so here’s a bit more on the story. As a kid in the 70’s I, like a lot of other nerdy kids, was really into the paranormal. UFOs, cryptozoology, poltergeists, it was all fair game. The era was fertile ground for all this, what with magazines like Fate, Argosy and Saga, and TV shows like In Search Of feeding us a steady diet of the weird and paranormal. Every school library had a few books in the genre, encyclopedias of the weird and unusual, illustrated with artist renditions of eyewitness accounts and some rather janky photos of purported monsters and UFOs. Most of these have long since faded from memory but a few stand out, one in particular would come to be known as the Lost Thunderbird Photo. The story goes that in the late 19th century there was a rash of news stories about giant bird sightings in the American Southwest. 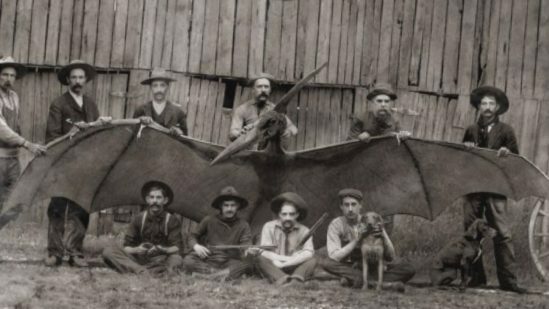 Accompanying the article there was a fairly clear photo of a group of men in typical cowboy garb posing with their rifles and a large, pterodactyl-type creature, wings spread. A pretty cool story, if hard to believe. But the real strangeness isn’t the story itself but in the memories of so many people. You see, despite hundreds of people claiming to have seen the same photo, no one has ever found the original magazine or book that it appeared in, despite intense searching. The search for the missing Thunderbird photo has been carried on by some of the biggest names in Cryptozoology, such as Loren Coleman, Karl Shuker and the late Mark Chorvinsky, whose terrific Strange magazine was where I first became aware of the hunt for the missing photo back in the 1990’s. The story can be traced back to a report in the Arizona Epitaph in the 1890s, but consensus is there was no photo accompanying the story. It seems to have been picked up by one of those magazines in the 60’s, possibly with a doctored photo added and reprinted through the years. But the interesting thing is, despite extensive searching by those above and many others, no one has ever found that seminal article from the 60’s. Many hoax or honest recreation photos have been found since the search became common knowledge, each with slightly different details. In some it’s a pterodactyl, a large bird in others. Some show it pinned to a wall, in others the men are holding it up or it’s laying on the ground. Sometimes just a few men, others as many as a dozen or more. The phenomenon where it is discovered that a global, well known fact has apparently changed for A LARGE GROUP OF PEOPLE. The effect & name refers to people remembering Nelson Mandela dying in prison in the 1980s, when he actually survived long after his release. I don’t know that I’d call the Thunderbird a “global, well known fact” but it seems that a lot of people who read the same books and magazines have the same memory. Most researchers these days seem to attribute it to a shared false memory, a combination of a vividly reported story and the suggestibility of youth. Some have semi-jokingly suggested that perhaps interdimensional time travelers have come back to remove all traces of the original photo, lest we somehow discover a secret gateway through time. As for me, I’m convinced the photo was real, that I saw it as a youth and someone will discover it any day now. Do you remember seeing the Thunderbird photo? Let us know how you remember it. 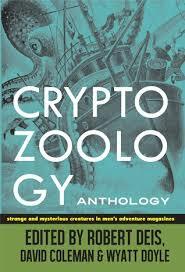 Sponsored link: While researching this post I came across a pretty cool book, Cryptozoology Anthology: Strange and Mysterious Creatures in Men’s Adventure Magazines . The book is exactly what the title says, reprints of stories from the classic men’s magazines of yore, complete with those great illustrations on high quality paper. It’s available for Kindle if you need instant gratification but I advise going for the hard copy, it’s something you’ll want on your bookshelf.